What do you get when ten disparate styles of filmmaking are fused together and structured to create a larger style and story? You might be familiar with anthology films where filmmakers chip in with short films strung together by a theme. But for the first time, 11 filmmakers from different parts of India have come together for a never-seen-before cinematic experience as they collaborate on one single film about one filmmaker. Buy one filmmaker, get 10 free! 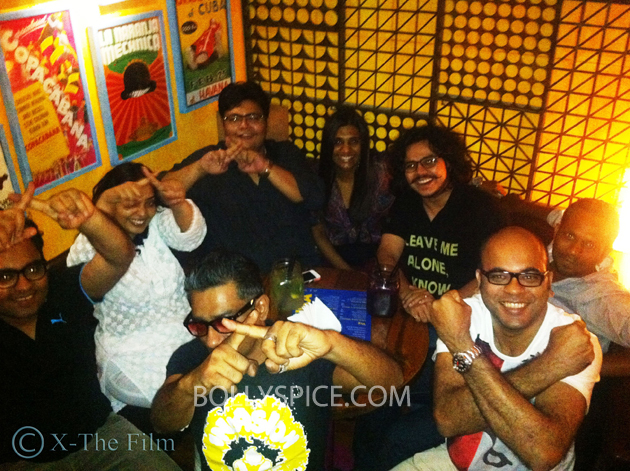 The film, titled ‘X’ is begin made by a aroup of directors who have received praise and positive feedback for their independent films released in the past year or two and include Abhinav Shiv Tiwari (Oass), Anu Menon (London Paris New York), Hemant Gaba (Shuttlecock Boys), Pratim D. Gupta (Paanch Adhyay), Q (Gandu), Raja Sen (film critic), Rajshree Ojha (Aisha), Sandeep Mohan (Love, Wrinkle Free), Sudhish Kamath (Good Night Good Morning), Suparn Verma (Aatma) and Thiagarajan Kumararaja (Aaranya Kaandam) will write and direct individual segments as writer-director K (Rajat Kapoor) goes back in time as memories of his 10 ex-girlfriends haunt him over the course of one night. ‘X’ is a filmmaker’s journey through his past encounters with his 10 ex-girlfriends as he spends one surreal unforgettable night at a film festival after he meets a mysterious girl who intriguingly seems to have something to do with every woman in his life. The filmmakers met in Mumbai last weekend to brainstorm and lock their individual segments after online interactions and exchange of over 300 mails for over six weeks. “What’s fascinating about the project is that in one film, you have such diverse voices with such varied visions come together… I had to get involved and say: You guys focus on the film and don’t worry about anything else, I’ll figure out the finances and production,” says Shiladitya Bora, Executive Producer on the movie. ‘X’ is already into production (one of the segments has already been shot) and is being planned for a release later this year. 15 queries in 1.072 seconds.